By Dennis W. Viau; an original creation. I made these per a request. All the research I’d done showed stuffings made mostly with ricotta and frozen spinach. Because I could not make the pasta from scratch, I wanted my stuffing to be above average. So I ramped it up with Italian sausage, anchovies, and artichoke hearts for a savory stuffing that benefits from depth of flavors. Delizioso! Heat the oil in a skillet over medium-high heat and add the onion. Sauté the onion, reducing the heat periodically as the moisture cooks off, until it is golden brown, 15 to 20 minutes. Remove the casings from the sausages and add the meat to the onions, cooking until lightly browned, about 5 minutes. Then add the anchovies, artichokes, garlic, and oregano (and optional red pepper flakes) and cook an additional minute. Let cool a few minutes and then transfer to a large mixing bowl. Heat about ¼ cup of water to boiling in a large skillet for which you have a cover. Add the spinach and steam over medium heat 1 minute, covered, then turn with tongs and steam for another minute. Transfer the spinach to a colander to drain and cool. When cool enough to handle comfortably, press the spinach between your hands (or use a potato ricer) to squeeze out excess moisture. Chop the spinach. Combine the cooked spinach, sausage-onion mixture, ricotta, about 1/3 of the mozzarella and Parmesan (or Romano) cheeses, pepper, and nutmeg. Mix and adjust for salt. Add the egg and mix well. Boil the shells according to package directions. Drain and rinse with cold water. Coat the bottom of a 9x13-inch (23x33cm) baking dish with a few tablespoons of marinara. Spoon stuffing mixture into each pasta shell and arrange in the baking dish. 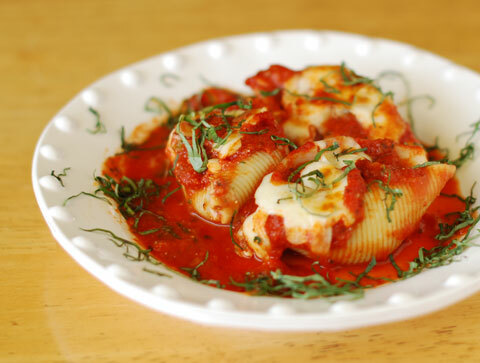 Spoon the remaining marinara on top and garnish with the remaining mozzarella. Bake, uncovered, at 350°F (175°C) until thoroughly heated, 20 to 25 minutes. Serve.